Pura Tanah Lot at sunset. Wave breaking at Kuta Beach. Silhouette of man carrying surfboard on Kuta Beach. Kecak dancers in ceremonial dress and make up. Shrine at Museum Puri Lukisan. Kecak dance performance around a fire. 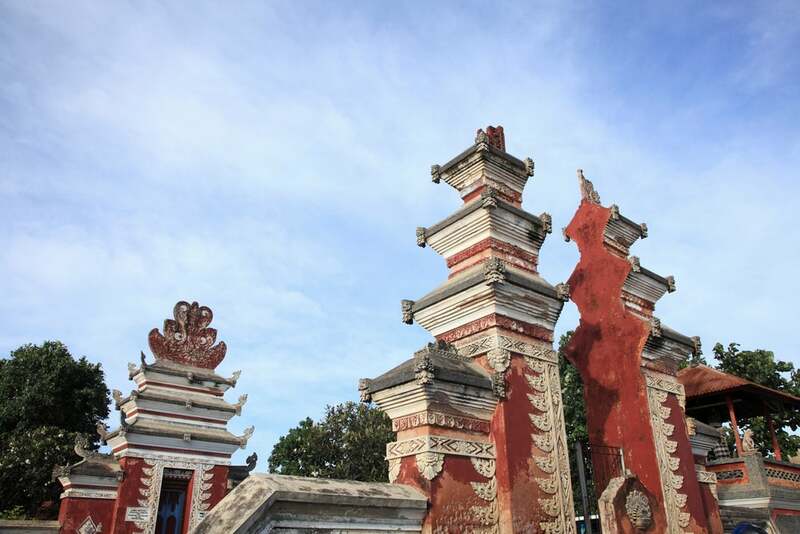 Gate of the Museum Puri Lukisan. Lotus pond in Museum Puri Lukisan. Pura Tanah Lot from the coast. Beach chairs and sun shade on Kuta Beach. Boys playing soccer on beach. Kecak dance performance at Pandantegal Temple. Surfer wiping out on wave. People carrying offerings at temple ceremony. Rice fields on the Ridge Walk. Woman placing frangipani flower petals at Hindu shrine. Coconut seller on Ridge Walk. Taman Bebek Villas, room interior. Hindu offering of frangipani flower on brass handle of ornate door. Women carrying offerings at temple ceremony. Tea at Ary's Warung 2. Tea and dessert at Ary's Warung restaurant. Table and chairs at Kupu Kupu Barong Hotel. Musician at Gambuh dance performance. Cultural guide leaving offering at a Hindu shrine.